January 1918 holds the all-time January snowfall record with 42 inches and January 1979 marked the largest record accumulation on the ground at one time (29 inches), but in 1967 a record snowfall brought the village to its knees. 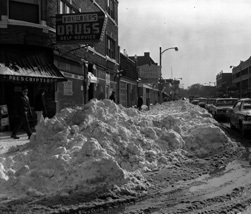 In 1967, Chicago’s weather was at its wackiest when a January thaw led to a record high of 65 degrees and then two days later the single snowstorm record of 23 inches in a 24-hour period beginning just before dawn on Jan. 26. The storm crippled the Chicago metropolitan area and brought life in the villages to a screeching stop. Locally, the storm resulted in the closure of Oak Park and River Forest High School for one of only four times in its history up to that point and left public works employees struggling with what to do with two feet of the white stuff. Enjoy these photos which show how the storm affected Oak Park--and also some buildings and businesses of the past. Do you have any stories of January 1967 or the snowstorms of other past winters? Send us an email and photos and we might post them here.